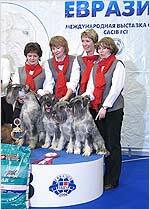 "Trels" kennel of Standard Schnauzers was registered in RKF in 1994. The breeder is Irina Trubnikova. Elsabr Noel "Trels" kennel is one of the first and largest kennels of Standard Schnauzers pepper&salt. The kennel's name is composed of Irina's surname - "Trubnikova" and the name of Irina's famous stud male - "Elsabr Noel". 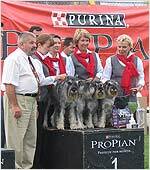 "Trels" kennel is breeding only Standard Schnauzers and only of pepper and salt color, i.e. stands by the chosen way. Best kennel of breed - "Russia 2000"